OK, last post for today. 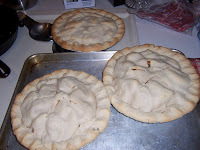 I thought I would share Elena's recipe for her apple pie and her pie crust. this is from her grandmother. Her mother's mother. Now, I am not a pie crust eater. I will eat everything but the pie crust. I just don't like it. Well, I do like this one!!! this will make about 10 pie crusts or 5 pie crusts if they need a top! mix well, roll out for pie crusts. freezes well. mix apple slices, sugar and cinnamon to taste. I have no idea how much. Elena just put some in, stirred it up, tasted it and added a little more. place a couple of teaspoons of cream of wheat on the top of the crust. pour in apple mixture. add top and crimp edges. use a fork or a knife to vent pie. bake at 350 degrees for about 35 minutes. Elena also says that they use to roll out the dough and cut out for sugar cookies. Yep, I could do that. it's that good!